Discussion in 'Lexus Lounge' started by LexusTechSA, Feb 13, 2016. James, mikeavelli, spwolf and 3 others like this. Great article. I would have never guessed they were going to sell that many LCs. Expectation for GSF is much lower isn't it? Lexus is expecting 6,600 annual LC sales globally, with the USA making up 60% of the volume. Trexus and Axel like this. Base model transactions will go for LESS than a 6-series? What a steal. a carbon fiber roof to replace the standard glass roof, performance seats with premium leather and Alcantara inserts, an active rear spoiler, and larger wheels have been the only options revealed so far. So wait krew, the seats that we've seen so far in pics and the auto shows with the LC, are those seats the regular ones or the performance seats? To me they look like performance seats. Some clarification from Lexus would have really helped here. One of the articles I read (probably Motor Trend's or one of the Andrew English articles) suggested that DRS (Dynamic Rear Steering) would also be an option (if not standard) on the LC. The standard seats ARE performance seats, I guess the optional ones will look more racy. Correct, GS F production is supposedly only 3k a year I believe....Lexus knows it won't be a big seller. For some comparison, the old SC 430 sold 12k I believe its first year and then 10k the first couple of years after until dropping off. Mind you that car was 62k or so back in 2002 (not sure of inflation changes). Joaquin Ruhi and Trexus like this. Joaquin Ruhi, mikeavelli and James like this. I've already got a customer chomping at the bit to give me a deposit. I'm told I have to wait until August to start taking orders. I hope Lexus keeps the production down, that way the car retains an air of exclusivity. Wait till August for deposits and it's released what spring 17? Upon launch in March 2001 the 2002 SC430 (Z40) started at $58,455 and under $62K USD, it calculates in USD to roughly under $79,000 and $83,000 with options. The LC is on another level like Templin said, considering that even the SC400 (Z30) was priced less than the LS400 (XF10) in 1991 by $1,500 USD and much less than the SC430 with inflation. It was meant to sit between the GS300 (S140) and LS400 (XF10), then elevated to sit parallel with the LS430 (XF30). I have to wonder how feasible the US volume will be, when BMW USA sells not only the F12 650i, but 640i, M6, and 4-door Gran Coupe (F06). In that case, I also wonder if it makes sense for me to buy stateside or in the UK (stupid VAT and surcharges), since Lexus USA cuts content compared to JDM or EU-spec Lexus models (NX300h Premier has more kit than US versions). Well, that is a bit of loaded statement though. One assumes they are referring to the US-market F12 650i Coupe at $88,700 USD and not 640i at $79,500 in terms of 6-Series. That is not really a "steal" comparatively, but a good price. I hope the launch of the new G14 6er in 2017-18 doesn't affect this nor the C217.5 S Coupe facelift in 2018. The C216 CL was a terrible seller after 2008 and isn't as common anyway. The SC430 went on sale in March 2001, so figures from 2002 don't really come into play for initial launch. One paid a bit more at launch, as prices probably weren't as firm and more flexible by January 2002. Almost like the LC500, the SC430 (Z40) was unveiled as a 99% identical "concept" in 1999 (but Z40 was done in 1998) and in production form in March 2000, so it was a long wait with pent-up demand (well not exactly 5 years). The Z40 SC430 (with inflation) at 2001 launch was most expensive at $83,000 USD, not including mark-ups during the first few months on sale. The real mystery is the price of the LC500h and the LS saloon (XF50/60). Will the LS500 be boxed in by a price ceiling from the LC500? At its launch, the SC 430 was marketed as the "jewel of Lexus", and as the marque's first convertible, was intended as a more ostentatious addition to the Lexus lineup. Reviewers from Car and Driver magazine praised the SC 430 for 2002 as "an unqualified success", calling it "comfortable, fast, smooth, and quiet" with "all of the virtues expected in a patrician roadster." Its such a great nameplate, I hope it comes back. I do think the LC will be better supported and with its dramatic styling will surpass the SC in regards to demand and being a halo model. The feedback I'm getting from non Lexus fans and owners is tremendous. RAL and James like this. I hope the SC comes back to but is there room for it with the RC and LC now? Yeah, strange to me too. I was told by the man who's name is on the building that we'd have to wait until we can see MSRP's, option and accessory pricing, things like that. I would have taken the deposit and then when that info comes out he'd have the first or earliest chance and ordering the car the way he wants. But like I said, my name isn't on the building. SC430 was very hot car at its introduction, and Lexus didn't allow dealer markup on its new cars. So, people had to wait in line. In its 1st year, some people traded in their Sc430 and were selling higher price than the new ones. 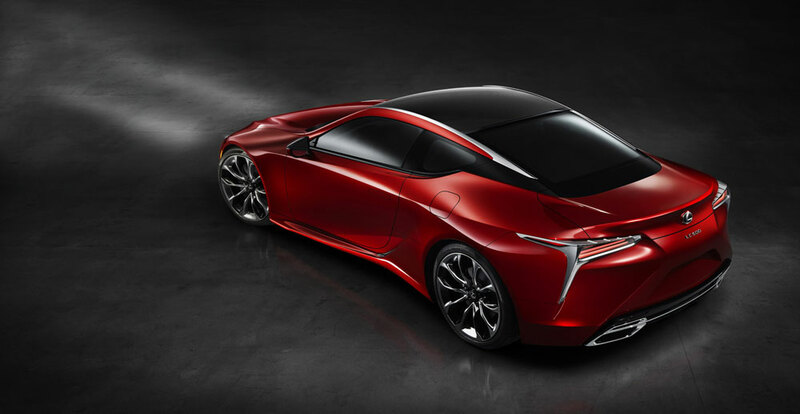 I will guess that LC500 starts at USD95-99K, 15K more when fully loaded, hybrid version costs another 20K or so. It is no question that it is gonna sell like hotcakes for the first two years, the really challenge to Lexus will be how to maintain a decent sale number after 4-5 years. Joaquin Ruhi and James like this. I agree selling initially is great and you have to strive for that but year after year Lexus has to keep selling and gaining interest. Very true, especially in the case of "halo" sports cars like LC. Toyota itself is strongly aware of this because of how GT86/FR-S sales plummeted farther and faster than they'd anticipated after the first year or two. Hopefully, the rumored convertible and F versions of LC will help maintain interest and sales numbers as it hits its 4th or 5th birthdays.